WHA68 Day 2 started off with a powerful discussion at a breakfast meeting at the Intercontinental hotel in Geneva. The meeting a discussion on Transforming Global Health through Private-Public Partnership(PPP): from concept to impact. The Food Network must have been consulted for he menu that morning, the break fast menu was everything you would expect from a Five Star Hotel, and more. The first gentleman I had the opportunity of chatting with was one of the top administrators at Johnson’s and Johnson’s, and many other sits in the room were filled with movers and shakers in the business world. Some of the speakers included Seth Barkley (CEO GAVI), Khawar Mann (Managing Director, The Abraaj Group), Michel Sidibe (Executive Direcotr, UNAIDS). One of the most outstanding discussions were from a delegate from the South African team who explained the significance of PPP in setting up an Electronic Medical Record Systems in health Centers in South Africa and pointed out areas that the Public and Private Sectors stand to learn about each other. This was Day One of my WHO Summer internship with the Global Outbreak Alert and Response Network (GOARN) which my Supervisor recommended that I should have running concurrently with the WHA68. The morning meeting was informative and showed and insider’s perspective of the Ebola outbreak. 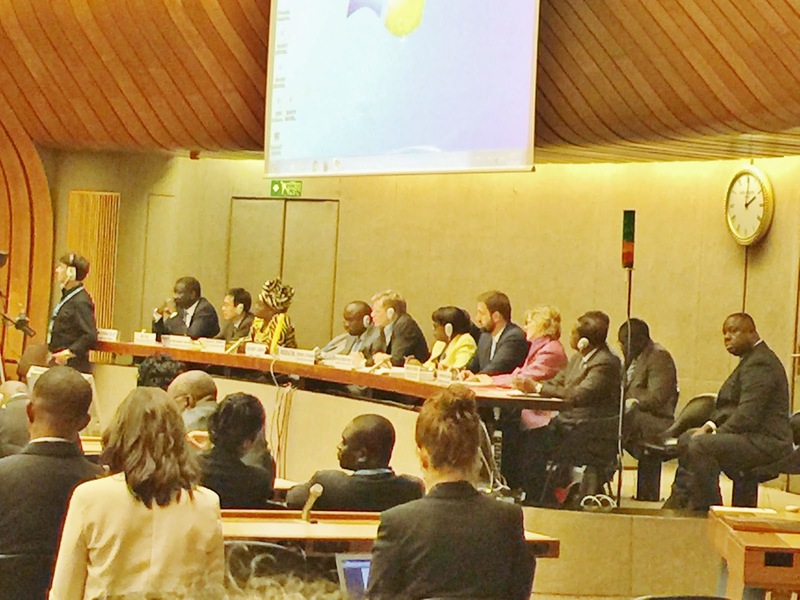 We later headed back to the Palais Des Nations for a technical briefing on the Ebola outbreak. The briefing addressed the need for WHO to better its structure and capacity to fulfill its mandate in emergency response. There was extensive discussion on status of and priorities of the Ebola crisis in West Africa. The speakers included ministers of countries affected by the crisis, responders and donors. The Director General gave opening remarks and one comment she made about discrepancy in what the media reports prompted the media to make noise that sounded like they were booing her. The DG gracefully carried on with her remarks. The politically correct finger-pointing was very refreshing compared to some of the scripted policy readings we listened to on Day One. The FCTC side event had a theme; Strengthening the synergy between WHA and the Conference of Parties (COP) organised by the degations of the Brazil, Panama, and Russian Federation. Speakers repeatedly reminded the audience that FCTC was the only treaty that WHO has drafted and put into practice since its existence. It’s in that way considered the ‘only child’. The speakers expressed that they were amazed at how the FCTC was being considered above legislation in most countries. The speakers expressed their concern that FCTC was no longer getting the attention it deserves to ensure that countries implement it. While at this event, my peers had an opportunity of attending an event with Koffi Annan and the Secretary General. I found it much easier to interact with WHA delegates on Day Two. My Internship supervisor introduced me to WHO employees at WHA along with all other Global Health people we came across in the Serpentine bar. There was a significantly greater resilience within my peers with the schedule and activity at the WHA along with the jet-lag we had all been battling. Below is a picture was taken at the Ebola WHO Technical Briefing.